Have you already made plans for the weekend? Want to learn which education, training and scholarship opportunities are out there and grab a cup of great coffee while you are at it? In a few days, on 25 and 26 January, the Ljubljana Exhibition and Convention Centre will be hosting Slovenian Educational and Career Fair called Informativa which brings together Slovenian and foreign educational institutions, scholarship providers and employers, and connects them with pupils and students to give young people valuable information about educational programmes, scholarships and professions they are interested in. They will get to know all about the jobs of the future, how and where to get a scholarship or gain hands-on experience, and will see how digital services make our life easier. Rapper Trkaj will take the young through an array of ESF-supported learning and employment opportunities. It is here they will also be introduced to the fundamentals of latte art. The Government Office for Development and European Cohesion Policy, the Public Scholarship, Development, Disability and Maintenance Fund of the Republic of Slovenia, the Employment Service of Slovenia, the Ministry of Public Administration, the Ministry of Labour, Family, Social Affairs and Equal Opportunities and the Institute of the Republic of Slovenia for Vocational Education and Training will participate in the Fair to show young people that there are countless opportunities for them to pursue education and career or tackle entrepreneurial challenges. The representatives of the Public Scholarship, Development, Disability and Maintenance Fund of the Republic of Slovenia will present different types of scholarships available (Zois Scholarships, Ad Futura Scholarships to Study Abroad, scholarships for skill shortage occupations), and provide information about the EducationUSA center, a great resource for information on how to study in the United States. The presentations will aim to encourage young people to start thinking early enough about how they will gain work experience as well as the skills and competences potential employers will be looking for in a few years’ time. The Fund offers a number of ESF-funded programmes that support young people, i.e. Creative Path to Knowledge, Študentski inovativni projekti za družbeno korist (Student Innovative Projects for Social Benefit) and Povezava sistema poklicnega in strokovnega izobraževanja s potrebami trga dela (Link between Vocational Education and Training System and Labour Market Needs) in obtaining hands-on experience. The programme Competence Centres for HR Development will be showcased to explain why gaining new skills and competences or lifelong learning is important for each and every individual, while some of the most sought after jobs of the future will be identified. Employment Service of Slovenia (ESS) offers a number of active labour market policy programmes that support young people in choosing a career path and making smart career decisions (Projektno učenje mlajših odraslih (Project Learning for Young Adults), Trajno zaposlovanje mladih (Incentives for Permanent Jobs for Young People), Usposabljanje na delovnem mestu (On-the-job Training), EURES, Kam in kako (The Where and The How programme) and getting informed and counselled in Career Centres (Karierna središča). Internet plays an indispensable role in job seeking, and young people who master social media are better off. The representatives of the ESS will give young people some tips on how to best use social media for a successful job-hunting strategy. Spotlight will also be put on the key elements of personal marketing, improving self-presentation skills and ways to prepare for and master a job interview. Coffee lovers will be excited to see professional baristas make coffee and get to know first-hand the techniques and secrets of latte art, while others will be able to try themselves in creating with modelling clay. The Ministry of Public Administration is responsible for development of advanced e-services, i.e. online user-friendly administrative services for all Slovenian citizens, and for entrepreneurs who can benefit from simplified ways of doing business through one-stop shop, thus saving time and money. 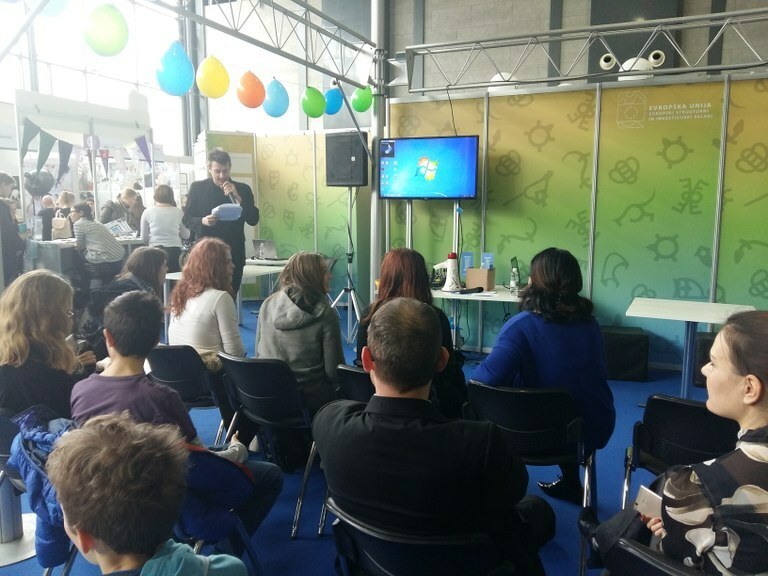 Get to know the services of Digital Slovenia at the Fair Informativa! Institute of the Republic of Slovenia for Vocational Education and Training will present National Vocational Qualifications, i.e. work-related, competence-based qualifications formally recognised through a system of certification. The Institute staff will also showcase Slovenian Qualifications Framework, a unified system of qualifications in the country consisting of 10 levels and aiming to classify qualifications into levels with regard to learning outcomes. EU funding supports a number of programmes that get young people into work, offer on-the-job training, encourage participation in formal education or short-term training programmes, foster creation of new businesses through cooperation with experienced companies and mentors, support enhancement of skills responding to newly emerging demands, etc. Information about funding opportunities is available at www.eu-skladi.si. The website is run by the Government Office for Development and European Cohesion Policy. The dedicated website offers Fina EU točka, a user-friendly service helping potential applicants and project promoters to find their way to relevant information on funding opportunities available either through EU funding sources or international financial mechanisms as well as on the system and rules on spending EU funds.